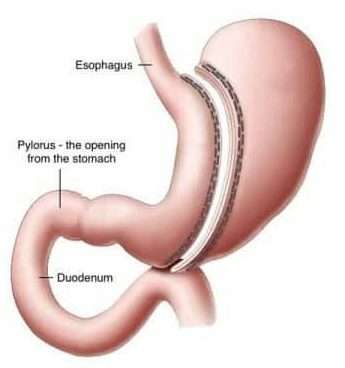 The Laparoscopic Sleeve Gastrectomy is a bariatric (weight loss) procedure that works to permanently remove up to 85% of the stomach via a stapling device, leaving the remaining stomach to form a tube (sleeve). The gastric sleeve has been performed in Australia for around 10 years and is performed laparoscopically (keyhole surgery), where patients typically stay in hospital for 2-3 nights after the procedure. When compared to other bariatric procedures such as the gastric bypass, the LSG has a lower complication risk. Also, there are generally no malabsorption or nutritional issues with the sleeve gastrectomy. Is the LSG right for me? The restrictive element – patients are only able to eat a small meal (typically around 1/2 a cup) before the stomach is full. As the stomach fills to accommodate the meal, nerves are activated which send signals to the brain to indicate the stomach is full, and to stop eating. It is important for patients to chew food slowly and take time between mouthfuls to allow time for these signals to be sent to the brain. The hormonal element – Patients do not experience as much hunger after the procedure. This is because the removed portion of stomach is responsible for producing ghrelin, a hormone that induces hunger. The combination of these two mechanisms allows patients to lower their caloric intake, resulting in significant weight loss. The sleeve gastrectomy will be completed by your Bariatric Surgeon via laparoscopic or keyhole surgery, taking 45-60 minutes. Your surgeon will use a stapling device to permanently remove up to 85% of your stomach, leaving the remaining stomach to form a tube or sleeve. You will remain in hospital for a 2-3 night stay. Following the surgery, you will be advised to follow a diet progression to re-introduce various food textures over a number of weeks. The gastric sleeve is a tool to aid weight loss, giving you a kick-start by allowing you to control portions as you develop healthy and sustainable habits. We know the LSG is most effective when accompanied by a lifestyle program, which is why at The BMI Clinic, it is paired with either our Silver, Gold or Platinum lifestyle program, delivered by a team of weight loss specialists, including Bariatric Physicians, Nurses, Dietitians, Exercise Physiologists and Behavioural Coaches. Data from our own clinic demonstrates the more a patient engages with the team, the greater their weight loss. Patients who undergo gastric sleeve surgery experience faster weight loss than with most other surgical or non-surgical options, with an expected weight loss of around 30% Total Body Weight loss (TBWL) over 12 months. For example, a 100 kg person would lose 30kg on average. We often refer to “excess weight loss” (EWL) when measuring the results from weight loss surgery, and we typically see around 60% EWL at 12 months with the LSG. Education and support are two critical components in achieving successful weight loss and maintenance. At the BMI Clinic, all of our procedures are accompanied by a comprehensive program to support your weight loss journey and to provide you with the knowledge and tools necessary to instil positive behaviour change. What support options are available if I have already had a gastric sleeve? If you already have a gastric sleeve, our Sense After Surgery program is the program for you. This program has been intentionally designed for those who have had their surgery performed at another centre, and are looking for ongoing support and education to enhance their weight loss experience. Your care during this 12-month program is co-ordinated by an integrated team of specialised bariatric (weight loss) doctors, dietitians, exercise professionals and behavioural coaches, all working to support you as you transition your lifestyle and achieve the weight loss you are after.